Finding the perfect bed for a large dog breed, such as an Airedale Terrier, Border Collie or Bull Terrier can be difficult. You need a bed that is big enough to accommodate them, soft enough to be comfortable, but well-made and able to withstand being used by an energetic and enthusiastic dog. For bigger breeds, look for large dog beds, sized at 32 or bigger. Adult dogs may need a 64 bed. Ruff and Barker make a great orthopaedic, memory foam large dog bed. 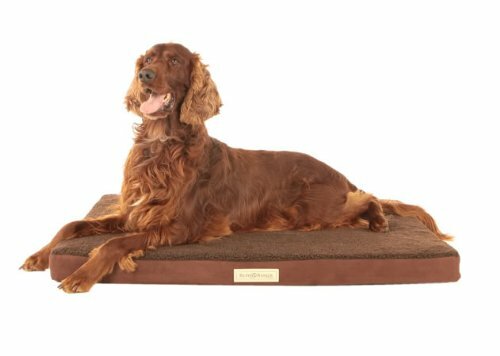 This bed is perfect for older dogs that need somewhere comfortable to lie down, and appreciate the extra padding. The cover is removable and machine washable, and the egg-box ortho foam should offer good cushioning for a long time. The beds are available in a range of sizes, including a jumbo-sized 40 x 30, aimed at Labradors and German Shepards. The Poi Dog Collapsible Dog Bed is perfect for families that do a lot of travelling. It features a removable inner cushion and a machine washable liner. The bed has a soft mattress and chunky, easy to flatten walls. The outer covering is made of water-resistant poly-canvas which is easy to take care of. If your dog loves to run around in fields and get muddy, then this is the perfect bed to take with you on camping or caravanning trips so that your pet doesnt mess up the car on the journey home. This faux fur dog settee is a 37.8 bed covered with luxurious looking paw prints. If you have a snooty dog that wants to feel like a king, then theyll love this design. The acrylic outer cover is easy to remove, and machine washable, but it isnt likely to withstand too much abuse. Older, well behaved dogs that dont get dirty often will enjoy lounging on their settee Just like the humans. This bed is soft and comfortable, but shows dirt quite easily. Do Not Disturb makes a great line of plastic dog beds. These beds are almost completely indestructible, and come with a ventilated base to ensure your dog is cool and comfortable in the summer, as well as non-slip feet for safety, and raised sides to stop bedding and cushions from falling out. These beds are perfect for young dogs that are likely to want to chew or scratch at their bedding. Combine them with a Ruff and Tuff mattress for added comfort. Unfortunately, these beds arent suitable for travelling, the larger models weigh more than 3KG. Let your dog sleep in style with this luxury fur lined sofa bed. 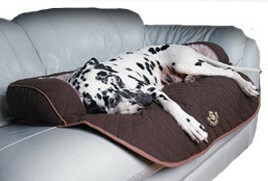 Available in black, brown or blue, this 36 dog bed offers the ultimate in comfort. This bed is designed to sit on top of a normal sofa, letting your dog share some quality time with you while youre watching TV or relaxing with a good book. The bed has a non-slip base, and is filled with recycled fibres. The lining is machine washable.